JAMES McCRACKEN, SR. 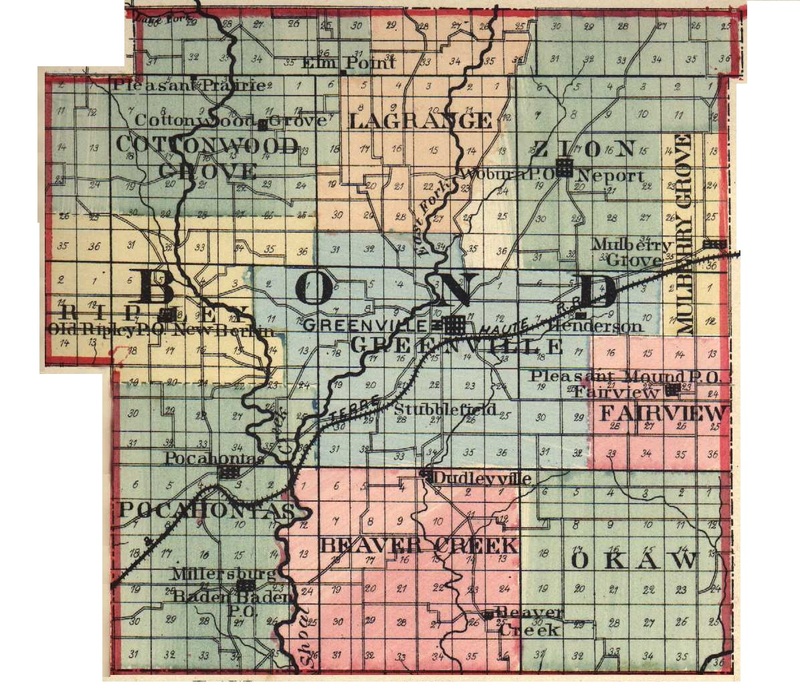 Although Southern Illinois is being developed within recent years in a remarkable way, it would seem that its natives have appreciated in a dormant manner the resources and advantages of the country, for instead of restlessly roaming in other places, as do the youth of so many other countries, they have, as a rule, remained at home, finding here all that they desire. Our subject, who resides in Shoal Creek Township, Bond County, is one of those who have appreciated the beauty and advantages to be derived from his native locality. He was born in the Prairie State, in Clinton County, November 28, 1814. He is a son of James and Nancy (Hauchen) McCracken. His father was a native of North Carolina, having been born there in 1776. His grandfather, whose name was also James, served in the Revolutionary War. About 1800, James McCracken, the father of our subject, removed to Kentucky and settled in a county which was later named in honor of himself. The family came to Illinois, however, some years before the birth of our subject, and located in Clinton County, where the elder Mr. McCracken died. The original of this sketch was the fourth child of a family of ten, and he and two sisters are the only surviving members, they having reached advanced years. His eldest sister, Nancy, is the wife of Barney Wright, and has been a resident of the State of Iowa for more than fifty years. Elizabeth is the wife of Henry Eile, who served in the Mexican War, and now lives in Barton County, Mo. Those that have passed away were: Jane; Nathan, a soldier in the Mexican War, who died in January, 1892; Ruth; Polly and Sallie, twins, between whose decease there was a lapse of many years, the latter having passed away only three years ago; John P., who died three years ago, also did his country good service in the Mexican War. Mr. McCracken was reared on a farm and the agricultural calling has been his life business. He came to Bond County in 1830, and settled in Shoal Creek Township, locating permanently in 1840 on the farm where he now lives. It is a beautiful rural home, whose eighty acres of fertile soil have yielded a rich return for the labor expended upon them. July 23, 1834, our subject married Mary M. Jones, a native of Maury County, Tenn., who came to Illinois with her parents in 1829. There is something impressive in the history of a union that extends over many years, where the interests of two people have become one, as is impossible to any relation except the marital. Especially is this true when God has given into the care and keeping of the parents little souls that are to be trained, not only to the highest type of manhood for this life, but with a view to fitting themselves for their sovereignty in the life to come. Sixteen children were born to the union of Mr. and Mrs. McCracken. The children who reached the age of manhood and womanhood are as follows: James, Jr., born July 4, 1835, in Bond County, married, November 27, 1866, Martha Armstrong, who was of Scotch and Irish ancestry. James, Jr., and his wife are the parents of four children, three of whom are living: James Edgar, Albert N. and Mabel J., the latter a teacher in the public schools. The second son was Elias, who died in the service of his country, in August, 1861. John T. is a farmer living in Shoal Creek Township. Elizabeth is the wife of S. H. Libby, of Reno. William P. is a farmer in this township. Hugh Douglass is a resident of Shoal Creek Township. Rebecca lives with her aged parents. Lucy is the wife of Charles Hennesey and lives in Ripley Township. Sarah J., George, Mary E., Albert H., Hiram N., Hattie L., Annie R. and Nathan L. are deceased. Long years ago the Democratic principles were instilled into the mind of our subject, and the constancy of his nature is exemplified in this as in other things, that he has always been true to his party. His sons have been brought up as loyal adherents of the Jacksonian faith. Mr. McCracken is an Odd Fellow and a member of the Farmers' Mutual Benefit Association. In his church affiliations, he is a Methodist. Of all the older pioneer settlers in this locality, none receive greater deference than does the venerable gentleman of whom we write. He is loved and honored by all who know him. Extracted 20 Dec 2016 by Norma Hass from 1892 Portrait and Biographical Record of Montgomery and Bond Counties, Illinois, pages 395-396.